The A-4 Skyhawk was designed by Ed Heinemann of the Douglas Aircraft Corporation. A lightweight attack aircraft that utilized a delta-wing design, it promised unmatched speed, range, and firepower. Its armament consists of two 20mm Colt Mk 12 cannons, 100 rounds/gun, and four AIM-9 Sidewinders. It was able to take more than its share of punishment, making it one of the toughest lightweight fighters during the Yom Kippur War in 1973. The A-4 Skyhawk was also the official aircraft of the Navy aerial demonstration team the Blue Angels and operated as one of the “enemy” fighters in the Top Gun program. This made the Douglas Skyhawk the preferred fighter aircraft in times of war and peace. Dubbed as “Heinemann's Hot Rod,” your aviation curiosity will definitely be satisfied by the A-4 Skyhawk. Famous for its lightweight structure and simple but functional design, this aircraft was used by the US Navy to deliver the swift hand of justice. The A-4 Skyhawk surpassed the Navy’s specifications and weighed only half the specified weight. 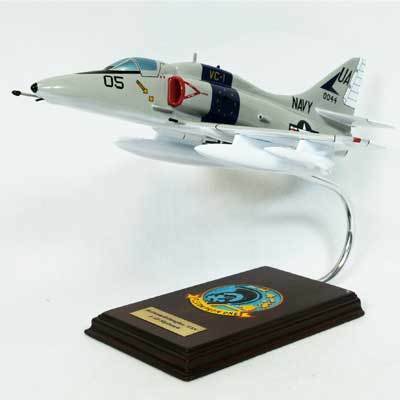 The ferocity of this fighter aircraft is now in compact form; through this museum-quality scale model aircraft, you can now display the A-4 Skyhawk wood model aircraft on your office desktop or on the bookcase in your living room or den. Its finely contoured shape and detailed finish will definitely give any room a touch of history.